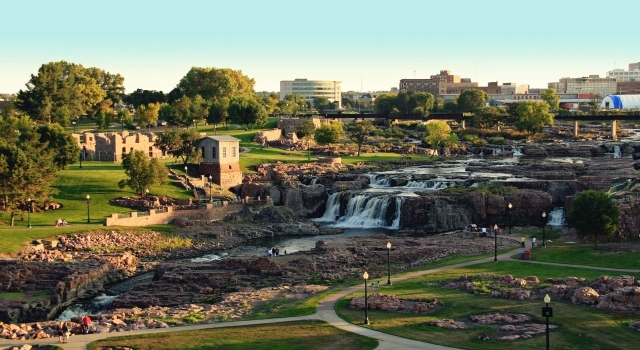 Falls Park is located in the heart of Sioux Falls and in additionally offers a visitors center, sculptures, an evening light show, and historic buildings. If you are visiting downtown you can leave your car there and take the free trolley to the falls. It runs mid-April to mid-October, Monday-Saturday and during the winter it runs just on Saturdays. Â Sometimes its nice to have someone else drive, but if you’d like to take your own car there is ample free parking at the park. I loved walking around and exploring the area. The waterfalls are pretty to watch. Benches located around the falls offer visitors the opportunity to sit and enjoy the scenery. Ambitious visitors can climb to the top of the tower at the visitors center to get a birds eye view of the falls and the surrounding area. That looks like a beautiful place to see!